UNITED STATES: President Donald Trump visited the southern border near the California town of Calexico on Friday. At a roundtable event, Trump expressed his concerned over the upsurge in illegal crossings, declaring that the “country is full” so migrants should “turn around.” The visit followed a week of tariff threats against Mexico and foreign aid cuts to Central American countries. California and 19 other states are suing the Trump administration over his emergency declaration to build a border wall. The Trump administration is seeking to drive border security agencies in a “tougher direction,” according to a statement from the White House. Yesterday, Kirstjen Nielsen announced her departure from the Department of Homeland Security (DHS). As DHS Secretary, Nielsen’s tenure became the object of Trump’s criticism for her leniency towards immigration control, despite enacting “zero tolerance” policies at the southern border. Kevin McAleenan, Customs and Border Protection Commissioner, will serve as acting DHS secretary. MEXICO: Former Mexican President Vicente Fox said Saturday that armed men tried to “storm into his house.” The reported incident occurred just four months after current president Andrés Manuel López Obrador cut off security services for former presidents. Fox, who was the president from 2000 to 2006, made the announcement via Twitter, saying that he holds the president “directly responsible” for his family’s security. Yesterday, López Obrador announced new security measures to protect former presidents, including Fox and Felipe Calderón, in office between 2006 to 2012. MEXICO: Massive power outages hit Mexico’s Yucatán Peninsula on Friday night. The states of Quintana Roo, Campeche and Yucatán had a two-hour interruption in their electrical services caused by a fire in Mérida, the capital city of Yucatán. The Federal Electrical Commission stated via Twitter that power was restored to the three Mexican provinces early Saturday. Over 400,000 households are said to have been affected. CUBA: On Sunday, over 400 animal lovers marched through Havana in a government-approved demonstration organized by Cubans in Defense of Animals. Unprecedented since the start of the country’s revolution in 1959, the socialist government allowed the animal-rights march to take place under surveillance of a few dozen state security agents. While some Cubans are optimistic about the government’s decision, most state-run media purposely failed to cover the events. Volunteers from the government-endorsed animal group also boycotted the march and plan to organize their own march for the same cause next week. Cuba currently does not have an animal-protection law, but animal groups continue to ask for it. PANAMA: President Juan Carlos Varela wrapped up his final presidential trip to Japan on Saturday. Varela met with Japanese Prime Minister Shinzo Abe in Tokyo last Thursday to discuss the progress of the Panama Metro Line 3 project, which Japan is helping construct using their monorail technology. Varela believes the ties between Panama and Japan will serve as an example to neighboring countries, while it also helps to promote the implementation of Japanese technology in Latin America. NICARAGUA: On Friday, 50 political prisoners were released and given house arrest in Nicaragua. The opposition, known as the Civic Alliance, calculates that over 600 protesters of President Daniel Ortega’s regime remain imprisoned. The Inter-American Court of Human Rights demanded the Nicaraguan regime to release the full list of detainees. Large demonstrations against the government was carried out on Saturday in various parts of the country. VENEZUELA: Large rival protests were held on Saturday as Venezuela braced for an intensified geopolitical showdown. As self-declared president and opposition leader Juan Guaidó called for nationwide mass demonstrations under the name “Operation Freedom,” incumbent Nicolás Maduro convened a “revolutionary mobilization” in Caracas the same day. Meanwhile, the United States imposed new sanctions on Venezuelan oil and called for Russian personnel to leave the South American country. The U.S. will now be represented by Switzerland in further de-escalation efforts, after Caracas broke diplomatic relations with Washington on Friday. ARGENTINA: On Friday, the International Monetary Fund (IMF) approved $10.8 billion in funds to Argentina as a part of the organization’s credit line to the nation beleaguered by double-digit inflation. 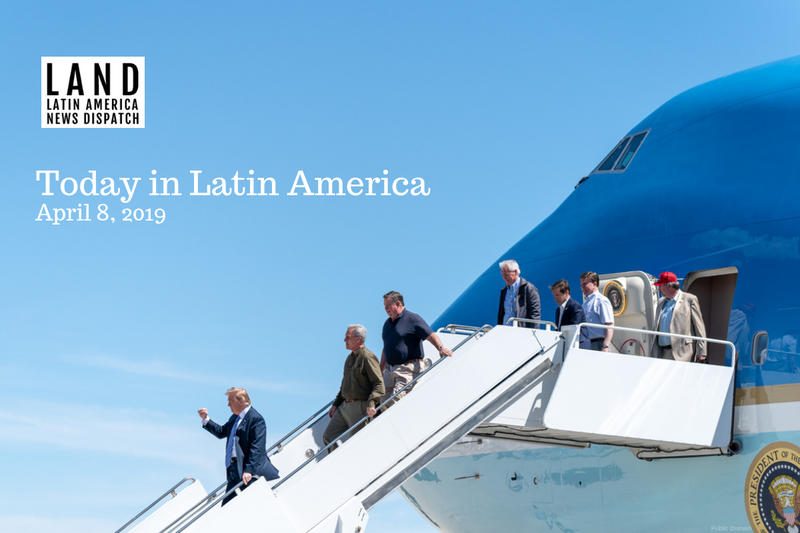 The third largest economy in Latin America agreed to the $53.6 billion standby financing deal last year and has had $39 billion approved by the fund since June 2018. In a statement, IMF managing director Christine Lagarde said the measures were “bearing fruit” and noted signs of recovery in the economy. BRAZIL: A 32-day expedition conducted by Fundaí, Brazil’s Indigenous agency, was declared successful after it came into contact with the voluntarily isolated Korubo tribe. A group of 30 government officials, accompanied by local tribespeople, vaccinated 34 Korubo tribe members and reunited them with their relatives. Additionally, the high-risk journey into the Korubo reserve, said to be the size of Austria, helped to ease tensions between the Korubo and the nearby Matis tribe, who were engaged in territorial disputes. March 31 was the birthday of César Chávez, who in the 1960s, along with Dolores Huerta, led a movement demanding higher wages, better conditions and more recognition for the dignity of farm workers. In a country that today employs more than 2 million farm workers, there are many stories of daily life and resistance in the U.S. food system. Reporter Chase DiBenedetto talked to Mario Sifuentez, who has spent his career collecting that history, starting with his home state of Oregon. Listen on latindispatch.com, Apple Podcasts, Spotify, SoundCloud or Stitcher.